As has become an annual Bungie tradition, a retailer has leaked info on the next big Destiny release. It’s not much, but here’s your first look at the marketing materials for Destiny 2, a video game that we will no doubt come up with all sorts of pithy ways to describe over the next few years. The above poster, leaked by an Italian retailer, hints at an upcoming beta. A second leaked poster with the same key art promises that the game will be out on Friday, September 8, although that may only be the European release. (Often, games come out in North America on Tuesday and then in Europe on Friday.) 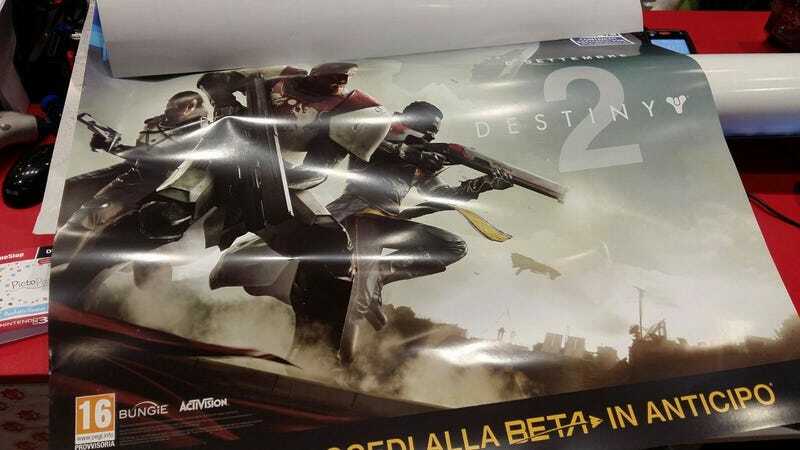 Both posters show three helmet-less humans, one of whom is holding what appears to be a Suros-branded shotgun. From what we’ve heard, Destiny 2 aims to feel drastically different than its predecessors in several ways. The plan has long been to build planet regions in Destiny 2 that feel less barren than the ones in Destiny, with towns, outposts, and quests. We’ve also heard that, yes, Destiny 2 is coming to PC. Bungie did not immediately respond to a request for comment.